I’ve been thinking about this lately because I just read Vaughn Roycroft’s essay on the topic. The timing was perfect because I was also reading Murder Most Howl by Krista Davis. No one but no one layers antagonism like a mystery author. Read on to see which layer might work in your story. 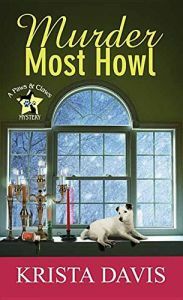 Warning: This post will contain spoilers for Murder Most Howl. Killer. In a mystery, the primary antagonist is the killer. As the protagonist, Holly Miller tries to track this person down while the killer does his or her best to remain out of sight. This can mean lying, planting false clues, or hiding actual evidence. Sometimes the antagonist has help. Killer’s Little Helpers. Roycroft’s term is “Agents of an Active Villain.” In a cozy, they are the friends or family who don’t want to see their loved one punished. This wasn’t an issue in Murder Most Howl because the killer was completely under the radar. The Primary Suspect. The suspect is usually the suspect for a good reason. In this case, Shadow is on probation after a manslaughter conviction. He doesn’t actively impede the investigation, but he does stay quiet about things he knows. He also distracts Holly from looking for the real murderer. The Suspect’s Little Helpers. Like the villain, the suspect has loved ones and who don’t want to see him back in jail. They may tamper with clues but, in standing up for Shadow, they are a distraction. Secondary Suspects. These people may not be the prime suspect but they also want to keep Holly looking at someone other than themselves. They too may have Little Helper. Law Enforcement. In a cozy, the detective isn’t law enforcement and that often causes problems. Holly and Officer Dave get along but she has to work to maintain this status quo. Accessories to Antagonism. These characters aren’t related to the mystery but get underfoot. Holly has her ex, her love interest, and her aunt. The town where she lives is holding a murder mystery weekend, so everyone involved in that gets in the way as well as does Holly’s actual job which demands attention at inopportune times. Inner Demons. Holly is assistant manager of her grandmother’s inn. Her grandmother, the manager, is on vacation so Holly worries that things will go South business-wise under her direction. Weather and Outside Forces. Anything that restricts movement or time creates a layer of antagonism. The inn’s guests are suspects for various reasons but they are in town for one weekend. They can’t get off the mountain immediately because of a blizzard. That creates two levels of tension – everyone is trapped in town with a murderer but when the roads open the murder can escape. Even if you aren’t writing a mystery, consider how you can add layers of antagonism to your story. In addition to your antagonist and her allies, you could have people who are creating secondary problems, time constraints, and weather. Or you might come up with something or someone that is unique to your individual story. Just remember - Each step of the way, make things more difficult for your character. Sue--I don't usually read mysteries and I certainly don't write them, but the way you broke down the layers--layers that every story has--gave me things to think about. Thank you. By the way, how is YOUR cozy coming? I agree with Sioux. I love the way you broke this down for us. And it is so true--just when we think the hero can't take one more thing, he/she finally turns itself around. Thank you, ladies. My cozy is stuck. Given my personality, I think that trying to write to the end and then rework it was a mistake. I may need to solve the problems and then get going again. But, I'm okay with that. I'm reading Save the Cat Writes a Novel and making notes and have just about settled on a new scene #1. Ah, I loved the way you broke this down. I need to use this as a checklist when I start the overhaul of my "Under My Skin," there are already a few layers, but this will help me amp up the suspense even more! I think the section "Killer's Little Helpers" is my favorite and so simple to add in!